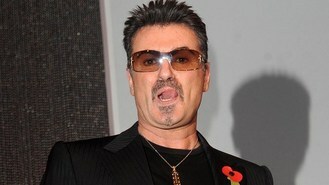 Chart star George Michael has performed for a Scottish audience in the first of two shows. The 49-year-old took to the stage at Glasgow's SECC wearing a black suit and his trademark sunglasses. He will perform at the same venue on Monday night as part of his Symphonica tour which was previously postponed after he spent weeks in hospital battling pneumonia last November. The show sees him perform with an orchestra accompanied by a screen featuring special visual effects. Earlier this month the singer made a return to the stage in Austria after being in hospital for several weeks in Vienna as a result of last year's illness. Michael, who celebrated his 30-year career in music in June, donated 1,000 tickets to the medical staff as a thank you gift for saving his life. The singer, whose real name is Georgios Kyriacos Panayiotou, will perform at various venues across the UK next month before heading to Australia in November. Two people charged with trying to extort millions of dollars from singer Stevie Wonder have pleaded no contest, Los Angeles prosecutors said. Christina Aguilera has insisted that she will make a comeback on The Voice, after announcing that she is to take a break from her role as judge. Lady Gaga has thanked her fans for understanding the "meaning of real beauty and compassion" after admitting she has piled on 25 pounds. Green Day's Billie Joe Armstrong is entering rehab for treatment for substance abuse. Miley Cyrus has revealed that she is planning to release a new album early next year. A "nervous and excited" Nick Grimshaw has taken over Radio 1's Breakfast Show. Nick Grimshaw has taken over the hot-seat in radio's biggest breakfast show by replacing Chris Moyles on Radio 1.